If there is one thing that all homes in San Diego and the surrounding areas need, it’s a reliable air conditioning system. At Global Warming & Cooling, we go above and beyond to ensure that our customers are kept cool and comfortable year-round. Our licensed and certified HVAC contractors have experience working with all types of air conditioning units in San Diego and the suburbs of Mira Mesa, Rancho Bernardo, Poway, and Rancho Penasquitos. Don’t take chances when it comes to your indoor comfort. We recommend yearly air conditioning service in Rancho Bernardo and a phone call to our air conditioning professionals at the first sign of trouble. If your AC system is not working efficiently, or it has stopped pumping cold air altogether, our technicians are here to help. We know how important your air conditioning system is to your health and comfort. If you live with someone who has allergies or asthma, we understand that you can’t just open your windows to cool off. You depend on your AC system. Air conditioning systems are complex and involve many moving parts and components. Sometimes, a simple air conditioning repair in Mira Mesa is all that is needed to get things up and running. If it turns out that you need a new installation, our technicians will discuss your replacement options. You’re in good hands with us because we treat everyone like family! Below are the air conditioning services that we offer to residential and commercial customers. AC installation and replacement. These systems don’t last forever, so there will come a time when San Diego air conditioning installation is needed. Usually, this happens when your AC has reached its lifespan, is no longer efficient or is beyond repair. 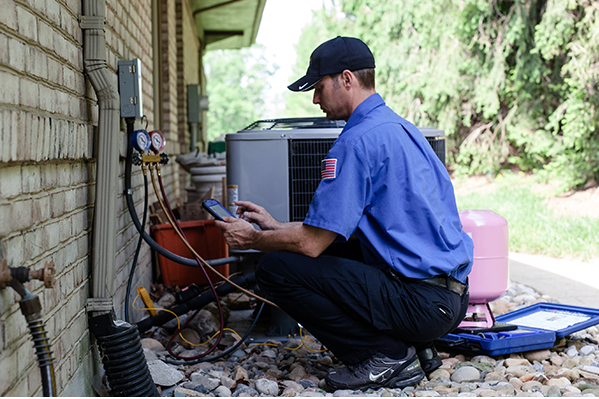 Count on our technicians to help you find an AC system that meets your needs and budget. AC maintenance. We know that some people avoid maintenance because they want to save money, but it actually ends up costing them in the long run! If your AC system isn’t working properly, the parts and components can wear out sooner. Also, a poorly maintained system is inefficient and uses more energy than needed. Let our techs take a look at what’s going on and get your system running optimally, saving you money. AC repair. No matter the age or type of AC system you have, our HVAC contractors in Poway will know how to diagnose and repair your system. We sell our parts at wholesale, saving customers money. For your peace of mind, we also have a guarantee on all parts and labor.